The clue to Paper Cinema’s work is all in the name. Borrowing from film, animation, comic book and puppetry, this is indeed cinema performed through the medium of paper; scenes formed live from hundreds of paper cut-outs and projected onto a sail-like sheet hanging at the back wall of BAC’s Council Chamber. Not quite definable as theatre, film or visual art, it might instead simply be classified as sheer, eye-popping ingenuity. Using this distinctive method of manoeuvring paper models and drawings in front of mounted video cameras, Paper Cinema wordlessly retell the story of the Odyssey. Simple line drawings and an evocative score are injected with the heroic qualities of Homer’s verse, transporting us to heaving seas and scorched deserts, all lightly coloured by the recognisable iconography of Hollywood. Telemachus’ journey to track down his missing father takes on the character of an American road trip; Hades is a hell of dreamlike 70s psychedelia; the action movie and historical epic are repeatedly invoked. Even the meticulously honed process of framing these scenes imitates the visual movement and camera angles of the movies, rendering afresh the familiar techniques of cinema. Strikingly – perhaps even more striking than the dazzling artistry itself – the production lays bare all its inner workings. On one side of the stage, two of the company sit surrounded by paper models, swiftly manipulating them in front of two cameras, while on the other side the band energetically dash between various instruments and objects, a live foley team in action. As stunning projections jostle for visual attention with the unveiled, astonishing work of the artists, the eye is torn by a desire to look simultaneously at the images and how they are being produced; at the magic and at the magician. This is not to suggest that the magic is ruined – if anything, the visible labour only makes the illusion all the more extraordinary at the same time as breaking it – but it does tear at the attention, sometimes productively, sometimes frustratingly. Perhaps it’s churlish of me, given the undeniable wonder that the work excites, but I found a small part of myself always reaching for that extra little insight that the piece never quite offers up. Rippling with charm and beautiful to look at, it’s pulse-quickeningly gorgeous but paper-thin. 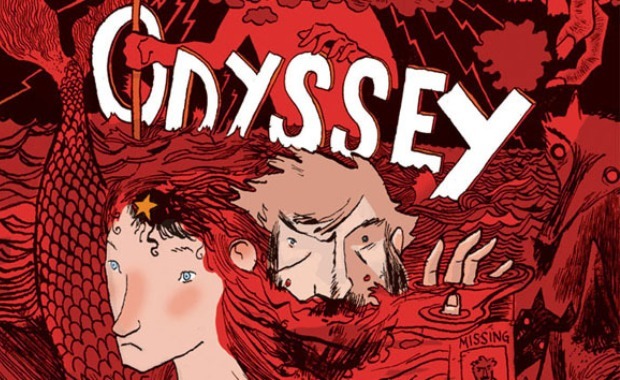 In between being dazzled by the miniature visual feats of the company’s storytelling, I wonder why, other than the understandable artistic ambition of taking on a work of such epic scale, Paper Cinema have settled on the Odyssey. There is maybe something about the timeless appeal of such narratives and the ways in which they find themselves reflected in forms, such as the Hollywood movie, which persist today. Paper Cinema’s endlessly inventive visual techniques also have a habit of making unfamiliar the ubiquitous narrative archetypes of both heroic literature and modern cinema, although of course this is not necessarily specific to Homer and doesn’t really offer an illuminating new way of reading the tale of Odysseus’ famous journey home. These, however, are nit-picking objections, complaints that quickly dissolve when confronted with yet another display of artistic virtuosity. Precise, delicate layering of the tiny paper models allows the camera to peek into windows and enter through doorways; flickering torchlight plunges us into a raging storm; the breathless chase of a boar hunt is swiftly summoned by sweeping fragments of scenery. And all the while, married to this skill is a homemade aesthetic that it’s hard not to fall a little bit in love with, recalling childhood paper cut-outs and games of make believe. By the end, whatever its small failings, it’s almost impossible to do anything but grin at the playful, mesmerising joy of invention.